I am still totally crushing on the Stained Glass die from KaiserCraft that I used yesterday. 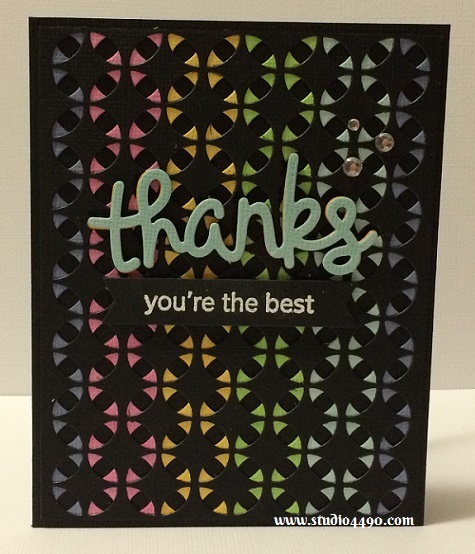 Yesterday, I used the cut out shape as a stencil and sponged over the top using Hero Arts Shadow Inks. After I had finished the sponging the image, I put the stencil to the side to finish creating the card. A bit later I picked up the stencil with the idea of throwing it away, but oh wow, the colours had smoothed and looked so very pretty. I decided to finish colouring in the shape. After I had finished I really wasn’t sure what I was going to do – and then the ideas hit! So, today, I have four very similar cards which I totally love. Materials used: Dies – Stained Glass (KaiserCraft), Scripty Thanks (Lawn Fawn); Hero Arts Shadow Inks (Hero Arts); Cardstock – American Crafts and Rhinestones (KaiserCraft). So sweet! And look how the colour pops when you use black instead of white. I thought another little sentiment might be fun to add another pop of colour. Materials used: Stamps – A Little Sentimental (Clearly Besotted); Dies – Stained Glass (KaiserCraft), Scripty Thanks (Lawn Fawn); Hero Arts Shadow Inks (Hero Arts); Cardstock – American Crafts and Rhinestones (KaiserCraft). Then I thought it might be fun to move the sentiment into the centre of the card. And there are four quick and simple cards! Can you imagine just how many different looks you could make with this die? 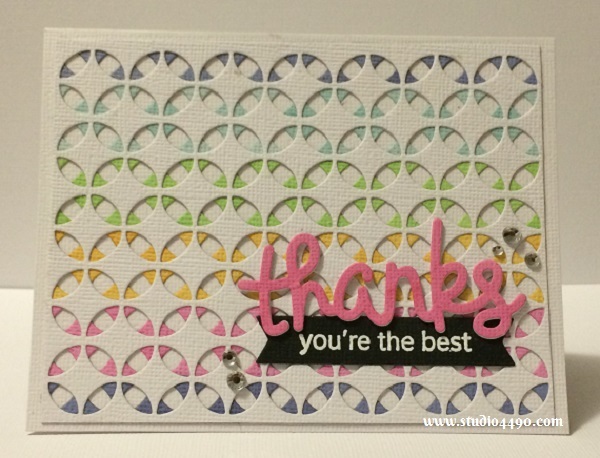 Use different colours, patterned papers, trim parts of the die cut away, stencilling…oh wow, so many ideas! I love it when dies (and stamp sets) offer so many different ways to use them. You’ve revealed wthe ‘stain glass’ impact of this die splendidly…and way to go in ‘recycling’ the stencil! I need to keep that in mind, as anytime I’ve used cardstock to make a stencil, I trash it! Need to look at what ‘prettiness’ might exist when the ‘messy’ has time to sit. Your sentiments are perfectly placed; they stand out without hiding the loveliness behind them. Yes indeed…smitten with all four! At first I was thinkin, did she colored this. Then I started reading, you must spend a lot time on it diecutting and glue things down. I really love the white cards!!! They look awesome!! Kylie, You are so fun to follow and so very talented. This stencil will be added to my “get eventually ” wish list ! Thanks ! Oh Mandy, you made my night! Thank you so much for the sweet words and lovely compliment. 🙂 (It is actually a die but I just used it as a stencil – it is sooo fun! ).